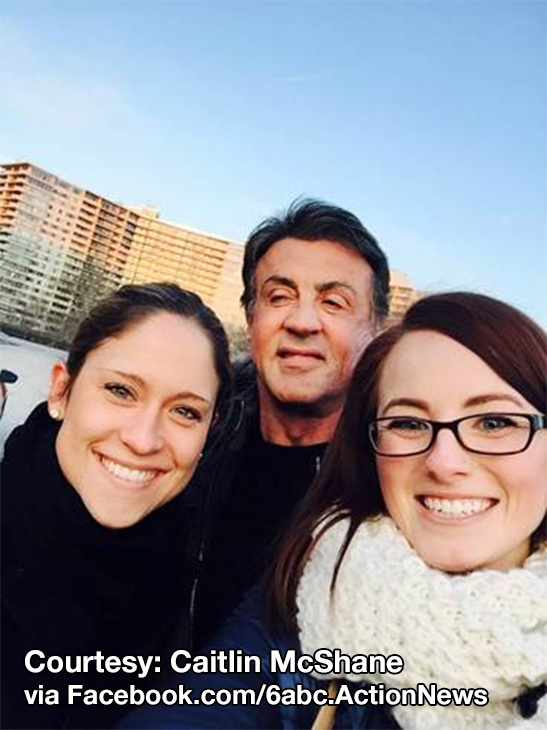 January 20, 2015: Tourists meet Rocky on the Rocky steps. 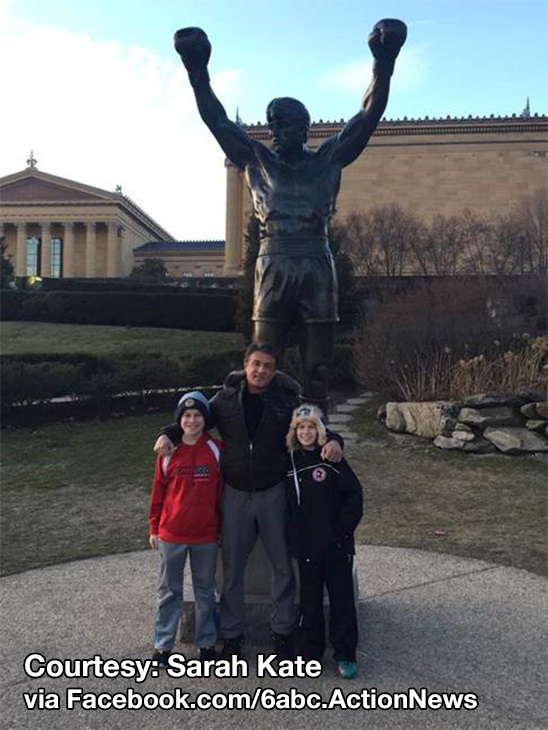 PHILADELPHIA (WPVI) -- A number of people who were at the Philadelphia Museum of Art this weekend took home a one-of-a-kind souvenir: a selfie with Rocky himself, Sylvester Stallone! Some of the people lucky enough to get a snapshot have shared their pics with Action News. "He said to us, 'Man, you guys are fast. You're making me look bad!'" Rowe said on Tuesday. Stallone then posed for a selfie with the trio, putting up one fist. "Look tough, guys!" he said, according to Rowe. Other fans of our Facebook page, Facebook.com/6abc.ActionNews, also sent in selfies! In this Jan. 17, 2015, photo provided by Peter Rowe, Rowe, right, takes a selfie with friends Jacob Kerstan, left, Andrew Wright, third from left and actor Sylvester Stallone. Stallone made the art museum's steps famous in his first turn as fictional boxer Rocky Balboa, who used them as part of his training regimen. Thousands of people now visit the steps each year to re-create the run and to take pictures with a Rocky statue, which originally was a prop in "Rocky III." Rowe's friends, Jacob Kerstan and Andrew Wright, were visiting him from Azusa Pacific University in greater Los Angeles. Rowe recently graduated from the university and moved to the Lancaster area, about 60 miles west of Philadelphia. Yet in all the time spent in L.A., Rowe said, they never saw a famous person. "What are the chances of meeting him, that celebrity, right there?" he said of the Stallone encounter, calling it "an unreal experience." Stallone is in Philadelphia for the shooting of "Creed," the latest installment in the series. It stars Michael B. Jordan, who appeared in "Fruitvale Station," as the grandson of early Rocky foe Apollo Creed. A representative handling casting for the Stallone movie did not immediately reply to a message asking about the photo on Tuesday.